In 2018, Apple announced support for two phone lines on the iPhone XR, XS, and XS Max but it wasn’t supported by the major carriers right away. I have had dual SIM phones in the past that left a lackluster experience with having two lines on a phone. After waiting to see others report of their experience, I decided to try it myself. In this video and the article below, I show you how well it works. If you are considering adding a second line to your iPhone, now is no better time! Hey, what’s up? It’s Jerad with State of Tech. Today I’m going to tell you everything that I know about the iPhone using two lines on the iPhone. Now in 2018 when Apple released the iPhone 10s, 10s Max and 10r, the phone supported dual SIM functionality. Now it doesn’t necessarily mean that you have to put two SIM cards in it. Essentially the phone still takes one SIM, but it also comes with an eSIM. An eSIM is a digital SIM card essentially hardwired end of the phone the same way the Apple Watch and a lot of other wearables come with an eSIM hardwired into them or programmed into them. So that’s essentially how the phone will support an additional line. And it looks like it has the functionality to accept more than one line. But right now all I’m aware of is support for two lines. So when we look at the phone, it’s a little hard to see, but with dual SIMs activated, the bars that you have, the signal strength is actually split to show you that you have two lines connected and sometimes one bar has more than the other. Now the reason that it shows up like this is because you can actually have SIMs from two different carriers. So you can have a phone number on AT&T and a phone number on Verizon. Think about those times where you have a preferred carrier in one area because signal strength is good, but you go to another location often and they don’t offer service there. 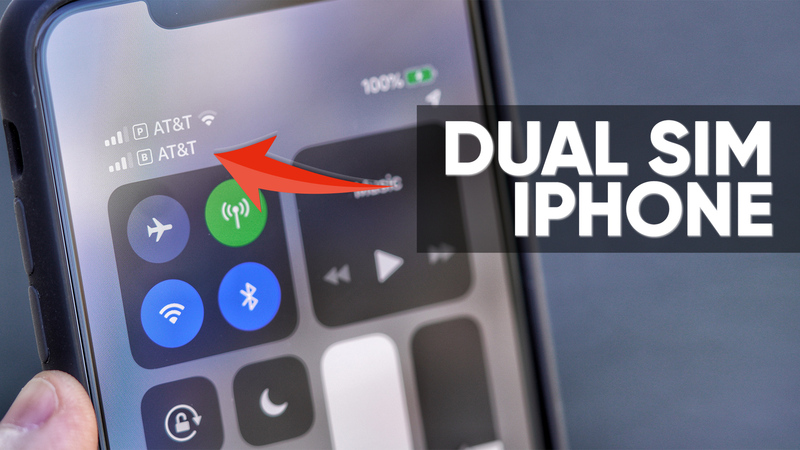 You can actually have two different carriers in your phone. You just have to make sure that you do have an unlocked iPhone in order to do that. If your phone is locked, meaning that you purchased it from the carrier, or purchased a locked version from Apple, you will need to get it unlocked first in order to do two different carriers. So far my only experiences have been using it with AT&T on both lines as the service. And the areas that I go is supported well by AT&T and I haven’t needed to switch to another service. The only service that I would maybe think about switching to for the secondary line would be Google Fi, but Google Fi doesn’t support eSIM devices yet, with the exception of their own phone, the Google Pixel. So if I swipe down from the top here to get to my control center, you can see that I have my P and B lines, my primary and my business line, which would be the secondary line. That’s what I labeled the secondary line as, as business. So you could see primary has LTE next to it because that is the line that I am using for data right now. You can also switch to your other line. So think about this. If you are a high data usage person, you use a lot of data every month and you’re constantly hitting that unlimited limit where they throttle your data, you can have two lines in here and when you hit that limit, you can switch to your other line and start to use data from there, essentially doubling the amount of data that you would have available to use on your phone plan, which is pretty cool. You just of course have to pay for two lines. So, that shows up here, that’s about the only difference that you’ll see in control center. The rest of the differences are going to be within the different apps that you use on a daily basis. For example, with text messages, when you go into your text message app, you’re going to see all of your text messages here. But if you want to send a new text message to somebody using your secondary line, you’ll go ahead and put in the number. So I’m going to put in the number and then when I go and tap in the box to text, I’m going to see that primary tag and I can actually tap and choose my other line, which would be my business line. So whatever you labeled it as, and you can give custom labels, we’ll look at that a little bit later in this video. So I can actually send this text message now from the secondary line on my phone. And then of course when I’m texting back and forth, it remembers that it is sending through that particular line and all text messages from here on out will be specific to that. So talking about contacts and how to set one as default, if I go into my contacts and so I’m just going to pull up a person here and you can see here that it shows the last used phone line that this person connected through. And I can actually hit edit and I could choose preferred line and then choose my business line or my other line as the primary contact. And so that way when I go to call this person, it automatically chooses the correct line and I don’t have to be choosing which line I’m going to call that person from each time. This’ll be great for you to go and separate your business contacts from your personal contacts. And that might actually be a good use of a actually using groups in contacts. So when you have your groups here, you might set a group for your business and a group for your personal contacts, so that way you can easily keep them grouped and separated and organized really well. I think that’s a excellent idea for that. Also, when you go into the keypad to dial somebody, you’ll see the primary tag up top and I can choose business and make that call from the business line or the secondary line. So it’s easy even if somebody is not in your contacts list for you to jump right in, just one tap, one or two taps, and you’re calling from the other line. All voicemails will pool into the same place. You can see here I have a few voicemails with P next to them because those are primary line voicemails. If I had voicemails from my business line, they would be labeled with B, so that I can see my business line voicemails there as well. When you go into your greeting to manage your greeting, you choose primary or business or whatever that secondary line is, and then you can customize your greeting and set up your greeting accordingly there. So I could tap on business, I’ve got access to that greeting here and then I can tap on primary and I’ve got access to that greeting there. Under your recent’s list, it will also show tags as well, so that you know what line a person called on and when you tap to call that person back, it will choose the line in which the call had previously been made using. Everything is customizable from setting your primary number to choosing what line is gonna use your data. So when you go into your settings underneath cellular, you’re now going to see your two different plans here. One of the things that you’re going to need to do is actually go to your carrier’s store to get that second line activated. I tried to do it over the phone with AT&T and they were gonna have to mail me everything that I needed in order to do this. What you’re going to need is an actual eSIM card, which sounds kind of weird because an electronic sim should not need a card. But this particular card here on the other side of it is a QR code and a couple of barcodes that you’re going to need to scan in order to get all the information into the phone. And you can do that by tapping add cellular plan and then scanning the barcode a that shows up. I’m not going to do that because I’ve already activated this SIM. After that, you’ll see here, default voice line I have set to primary. I can also set that to business if I wanted to. And then under cellular plans I can toggle whether they’re primary, this is the tag here, whether it’s called primary. There’s lots of different tags you can give it or you can also add your own custom label. I can turn this line on or off. So for the fact that I’m using my secondary line as my business line, if I was on vacation or if we were closed for a couple of days, I could just toggle that to off. All phone calls are gonna go directly to voicemail and all text messages, I guess won’t work. I haven’t turned that off, but maybe text messages will work, just phone calls won’t. It’s not something that I want to mess with, but if you did want to disable the line, you can easily do that. You can also choose some of the other specific stuff like Wi-Fi calling calls on other devices. So do you want calls coming into this phone pushed to your iPad, pushed to your Mac? That’s something that you can set up on a per line basis. Carrier services is something you aren’t really going to mess with. You have your phone number and then enable LTE voice and data or data only. This is pretty interesting because you can now toggle here between which line you want your data to be using. And that’s a great feature to have because like I said at the beginning, if you use a lot of data and you start to get throttled, you can then switch over to your other one. And being able to set those is great. And you can also have it set to work only on voice and data or data only ’cause maybe you’re only wanting to use that second line for data. You don’t want to use that second line for phone calls or text messages. So all the things that I showed you with setting primary contact lines and all that stuff would disappear if I chose data only. Up at the top you’ll see cellular data set to primary. This is where you choose which data line is going to be used on your phone. Now I can go and toggle that between the two or I can choose cellular data switching. Now when you make a call, typically your LTE drops down to a lower connection rate, especially if you’re using Wi-Fi calling. And that means that you’re not able to use as fast of data when you are in the middle of a phone call. So if you choose cellular data switching, that means when you’re in a phone call, it’s going to use LTE from the other line, making sure that you still have fast LTE connection or whatever connections are available in your area. I’m choosing that option because sometimes I’m on a phone call that might be 30 or so minutes long. I’m trying to browse the web and browsing the web or using social media or anything like that is super slow because I’m in a phone call. So with that cellular data switching solves that problem immediately. What do you think about iPhone Dual SIM support? So here’s where I hand it off to you so we can talk about it down in the comment section below. Let me know what your thoughts are on this dual SIM. I think that Apple has really done one of the better jobs at integrating dual SIM into their technologies. I’ve had dual SIM phones before where you actually do have two physical SIMs in the phone. And the first SIM always worked great with 4G LTE, where the second SIM always had some subpar level of connection because of having to have two radios in the phone and all of that stuff. It made the process much more difficult. So I think that Apple has done a great job with the integration here. It’s working out well for me so far. I’d love to hear your thoughts down in the comment section below and hope that you found this video and article useful. If you did, share it with someone and subscribe to our channel so you can get updated when we put out new content. Thanks so much and I hope to see you back here soon. Can You Turn The Screen Black, Yellow or Red with These Puzzle Games? The Best Mail Client Newton Mail Returns!